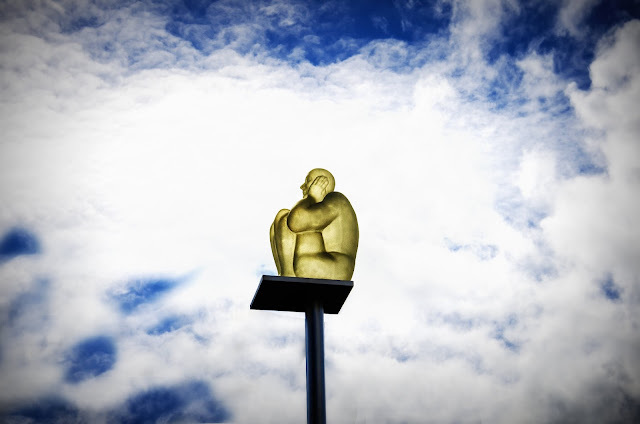 If you ever went to Nice, on the French Riviera, you probably visited the Place Massena and saw the stunning sculptures by Catalan artist Jaume Plensa. Well... I found two of these in Paris - or rather near Paris to be frank as they are located in Vitry, a city that is part of the Paris suburbs ! They are huge, posted on a pretty high poles (overlooking the road) and they are lit at night. Really beautiful, and frankly, quite unexpected in this neighborhood. Wow! You have just been hitting them out of the park lately, sir. LOL!! I did not know the expression, but someone explained it to me. Thank you! Great statue! And your photo of it is perfect. Wow! to the pic and the sculptor. I hadn't heard of him or seen any of his work. Thank you! You should see these statues in Nice, it's really fantastic - at night, in particular. Mrs.Vandertramp got it right. Out of the park! "Forget Nice, we've got statues too! Vitry...your window to the world!" Er... Vitry still lacks a few things compared to Nice, like... the sea or "the French Riviera"! Must agree with Mrs. Vandertramp! This reminds me of the 1920s fad of flagpole sitting (or how about St. Simeon Stylites, who sat on top of a column for 37 years?). Love this! Clouds make the perfect backdrop for an unexpected sight. Yes, even though I'm fed up with clouds now!! It's summer for heaven's sake! Tell me about it :). Like the layout of your blog...fun that there is a choice of places to comment - twitter or in the comments. Nice! He's thinking, "How did I get up here? It must have been one hell of a party"
LOOOOOOOOOOOOOOOOOOOOOOOOOOOOOOOL ! You made me laugh again!